Following a closed-door briefing with CIA Director Gina Haspel on Tuesday, top Senate Republicans said they had no doubt that Saudi Crown Prince Mohammed bin Salman had ordered the killing of Washington Post journalist Jamal Khashoggi. The GOP senators’ certainty of the crown prince’s involvement in the killing breaks with the narrative from senior White House administration officials and from President Donald Trump, who have said there was no "direct evidence" that connected the crown prince to Khashoggi's murder. Republican Senator Lindsey Graham, a close ally of the president, offered the most searing condemnation of bin Salman, calling him a "wrecking ball," "dangerous" and "crazy." "There’s not a smoking gun, there’s a smoking saw,” Graham said, referring to the reported bone saw that was allegedly used to dismember Khashoggi's body after he was killed, and to Defense Secretary James Mattis having said there was no "smoking gun." "You’d have to be willfully blind not to come to the conclusion that this was organized by people under the command of [bin Salman]," said Graham, who later suggested the Trump administration had been purposely offering a deceptive narrative. Remarks made by Graham and GOP Senator Bob Corker were direct rebukes of Trump's, Mattis's and Secretary of State Mike Pompeo's statements on the slaying. Pompeo told reporters last week, after a briefing with senators, that there was "no direct evidence" showing that the crown prince had ordered the killing, while Mattis said there was "no smoking gun." National Security Adviser John Bolton has continued to defend his decision not to listen to an audio recording of Khashoggi's killing. The absence of Haspel at last week's meeting at which the CIA's findings on the murder were initially presented angered both Republicans and Democrats. Portions of the CIA assessment of Khashoggi's murder had previously been leaked, concluding that the crown prince had ordered the killing of Khashoggi, which occurred on October 2 in the Saudi Consulate in Istanbul. Trump has taken the crown prince's word over the conclusion of his own intelligence community. "Maybe he did and maybe he didn’t!" order the murder the journalist, Trump said in a November 20 statement. Corker said that if the crown prince "went in front of a jury, he'd be convicted in 30 minutes." The Tennessee senator said that, following the Tuesday CIA briefing, there was "no question whatsoever" about whether the crown prince had ordered the journalist's murder. While Capitol Hill Republicans and Democrats agreed that bin Salman was complicit in the murder of Khashoggi, they differed on how to address it. Graham said, it would become "very difficult [for the U.S.] to do business" with the country. 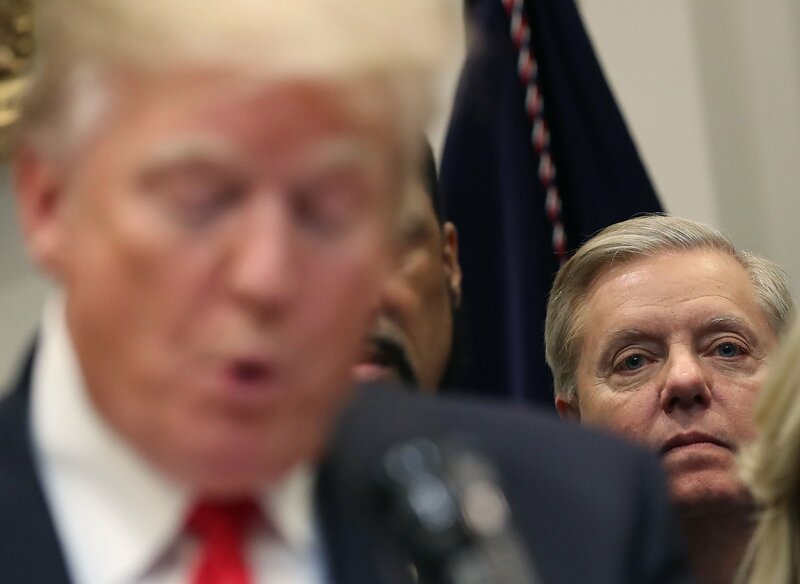 He said he could not support America's arms deal with Saudi Arabia, a country that is a "strategic ally" and whose "relationship is worth saving, but not at all costs," Graham said. "We'll do more damage to our standing in the world and our national security by ignoring [the crown prince] than dealing with him." Graham said that he believed sanctions need to be imposed on not just the individuals involved but on the country. Pompeo urged senators last week not to move forward with a measure to end U.S. support for the Saudi-led civil war in Yemen. Against the wishes of Pompeo and the White House, senators voted 63-37 to advance the resolution.